Working line German Shepherd Puppies. Bred for the intelligence needed by natural protection family companions and service dogs.Extensive socialization and early training using observational learning and positive reinforcement. 16 -week-old, Eliot of Tre'Good enjoying a camping trip with his new family. We never X-ray our females during pregnancy. It is a common, commercial practice to x-ray pregnant females to determine how many puppies are going to be in a litter so that reservations can be taken. The practice puts puppies at risk of developing cancer at a young age. We stopped doing x-rays on humans during pregnancy because of the increased risk of the child developing cancer. Dogs are no different than humans in their response to prenatal radiation exposure. We are aware that maternal stress during pregnancy adversely affects the mental and emotional development of puppies. Females that are kept isolated in kennels can experience chronic stress PRECIPITATED by the unnatural living situation. Dogs are pack animals and do not emotionally thrive when kept in isolation. A couple of hours per day of training or exercise does not compensate for the lack of social bonding that German Shepherds need daily. Dogs should be bonded to a human family or a dog pack for mental and emotional health. Chronic maternal stress induced by social isolation is not only cruel, but can have life-long effects on the mental well-being of the new puppy that you bring into your home. Scientific research has found that puppies born to Dams who experience acute or chronic stress during pregnancy are at risk of developing retarded motor and learning skills, as well as abnormal exploratory, social, and maternal behaviors. Our commitment to keep our dogs out of kennels and engaged in daily life prevents maternal stress and the complications of chronic stress that are handed down to puppies. Every Tre'Good female lives with her handler and maintains her regular routine with her human and the other dogs during pregnancy. She is not running up and down the fence line of her kennel lost in anxiety induced by isolation. Shepherd moms maintain their normal routine during pregnancy. We add maternal "TTouch" and massage to keep our girls relaxed and their endorphins high, which has a very positive impact on the developing puppies. During the last week of pregnancy, the whelping box is set up inside of the handler's home. The puppies will be born with the assistance of the dog's handler in her familiar family surroundings. We are not proponents of neonatal stress stimulation for puppies. The fad began in the early 1960’s based on experimental research. Recent studies reveal that neonatal stress may have a detrimental impact on both brain development and metabolic health. The only benefit of early stress may be an increase of maternal licking and attention given to the puppies when they return to the whelping box. We do not believe neonatal stress stimulation is beneficial. Instead we use methods to increase maternal licking and care of the new baby puppies. Puppies are born blind and deaf but they do have a fully functional sense of smell. We do not want our puppies to associate the smell of humans with stress--another reason we do not remove our puppies from their mothers. There are plenty of stressful experiences for a new puppy in a whelping box. We make sure that when we rescue a puppy and return it to safety that the puppy gets a good smell of our hand. This is the first step in teaching puppies that their humans are their ultimate protector and safety. We have created a method that associates the smell of humans with safety and relaxation. Our goal is to create confident, calm dogs that associate humans with the good things in life--not stress and anxiety. We do desensitize our puppies to human touch while they are in the nest with their mom. From birth we touch claws, foot pads, ears, tails and the inside of the puppies mouths. When your dog needs grooming, nail clipping, teeth brushing or an exam at the vet, your dog will accept these experiences as normal since the touch began at birth. We do not have to try to train a level of acceptance later in development. The pups accept ”invasive touch”as a normal part of their lives. Building a better brain also begins in these early days. Oxytocin the bonding hormone and sensory experience enhances early cognitive development. Keeping the nest in a quiet, secluded location relaxes mom so she can focus on nurturing her pups (bonding touch=oxytocin) instead of focusing on protection of her brood. For sensory development we place pads in the nest along with other sensory objects to stimulate the pups as they move about the whelping box. We do not put the pups in any situations that they do not freely choose. Puppies whose needs for mothers care (love), safety, and sensory experience are met, grow into individuals who can bond deeply and trust in their relationship with you. When a Shepherd knows you have her back she will always have yours. We want our puppies to associate the smell of humans with security and relaxation, not stress. The pup above feels as secure napping in her handlers hands as she does nestled against her mother's stomach. When the pups ears open we immediately begin to present all the sounds of the world. Once again pups will not be frightened by sounds they hear as soon as their ears develop. We now begin to enrich the puppies environment. Enriched environments increase cortical thickness, synaptic size and number, instructs neurological development and increases IQ, learning ability, and memory. We know that if we lock a child in a closet with food and water but little stimulation, the child will emerge later in development a fragment of the person he could have become. But, raising dogs in this manner is common practice. Under common industry breeding and rearing practices, our dogs emerge as something less than their true cognitive and emotional birthright. As soon as the puppies have a desire to explore their environment, we increase the size of the whelping box, add toys, different walking surfaces, and humans for the pups to investigate. The humans now take on some of the physical touch and nurturing the pups have been getting form mom. We begin to transfer the release of oxytocin (the bonding hormone) from interactions solely from mom to the new physical touch and nurturing they receive form humans. The puppies now enter preschool. the preschool room is filled with wonderful climbing gear, toys, visual and sensory experiences. All explorations are at each individual puppy’s pace. Nothing is forced on the pups. All learning at this stage is self directed. A puppy needs to develop a sense of competence in his/her own ability to tackle life experiences. Humans are in the room for cuddling and holding as well as to talk to the pups to develop the language centers of the pups brains. Dogs do not posses language to the same extent as humans but they do process our language in the same area of their brains as we do. It is amazing that dogs can learn our language. Never underestimate their abilities. dogs can learn the meaning of of a couple thousand words. They can also learn the difference between nouns, verbs, praise and negatives as well as sentence chains. The pups are now beginning to wean off of their dependence on mothers milk and soft food is being introduced. We now use the food to teach the pups that humans are not only a source of love but also food. Very basic training and response to verbal cues begins with treat rewards from the handler. Click on the picture above to see pictures of the enrichment room. The pups now graduate to Kindergarten. They now move outside to the puppy yard where new obstacles, wobble boards, water play, plastic filled pools, swings and other environmental stimulation is found. If mom is willing at 7 weeks the puppies are introduced to our other dogs. They spend time playing with their parents, grandparents, and our other dogs. Their time together helps refine the polite, social behaviors of the puppies, which they will need to socialize with other dogs and their new human family. Under the watchful eye of their elders, the puppies begin to explore the natural environment of their fifteen acres.. The importance of free exploration of the natural world cannot be overstated. The pups neurological development is greatly enhanced while they romp together in the pastures and forest of their home environment. Floppy is six pounds of teacup dachshund dominance. A puppy must learn how powerful it is before it can learn to control that power. Floppy teaches puppies to play using physical restraint. The lesson contributes to a dog who is composed around children and the elderly. A seven week old puppy takes a peek at mom and dad before entering an environment that is new to her. We begin basic puppy training with nature hikes. 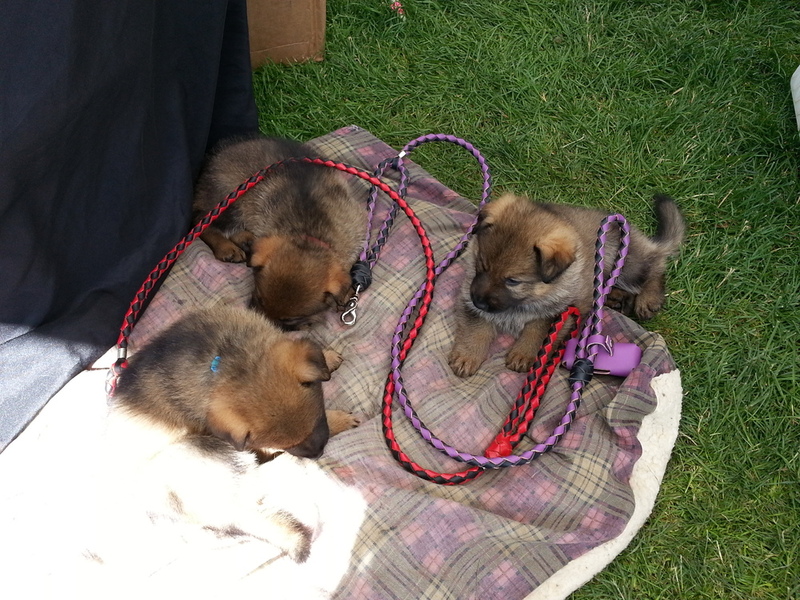 The puppies follow their parents and a handler through the forest. Problem-solving begins as the puppies decide how to go through, over, and under natural obstacles to keep up with the pack. Puppies also learn to look up to their ultimate leader and protector, their human, during these hikes. The handler is always there to show a pup how to search out ways to overcome a difficult obstacle during the walk. Teaching basic obedience commands begins during the walks using food as a motivator for the always hungry pups. We utilize their parents as role models for the obedience command execution. The pups are always very curious about our interactions with their parents. They watch and learn as their parents perform basic obedience commands reinforced with yummy treats. The pups quickly begin to imitate their parents response to the obedience commands. By using imitation for early puppy training, we try to eliminate any connection that could develop between training and mental/emotional stress. Because we use positive reinforcement techniques "only" during puppy training (no compulsion), our puppies associate obedience work with safety, fun, and play. Our early work with our puppies creates dogs that are easy to train for any job you have planned for them. Your puppy will arrive at your home knowing basic obedience commands. He/she will be leash broke and will have a basic understanding of housebreaking. It is very important to us that your new family member makes a smooth transition into your home. We dedicate many hours to the development of each, individual puppy. Your pup also comes with a free six week super puppy course (one hour per week)). If you live out of state, we offer a condensed class that can be taken in few days when you pick up your pup. We can also bring your pup to you and offer the course at your home for a travel fee. It is our goal that every Tre'Good pup quickly becomes a valued member of your family. We have found over the years that German Shepherds have unique critical fear periods. Critical fear periods seem to come early to Shepherds. Most breeds are out in the world early and brought back home around 8 weeks to ride out their fear periods. Shepherds are ready to enter the world around 8 weeks after a long enrichment period at home between 3 to 8 weeks of age. This is simply our experience with our line of German Shepherds. We are not saying this is the correct time frame for other breeds of dogs or all Shepherds. But, we do wonder if Shepherds have dropped out of service work not only because of breeding for the wrong qualities but because they are brought out into the world to early and then placed in lock down when they should be out learning about the human world. We begin to bring the puppies out into the real world. Handlers will place the puppies in front carriers and take them along during trips into town. The mother also goes on these excursions with the pups. Her calm reaction to the outings reassures the pups that there is nothing to be frightened of in this new world. We expose the pups to the sights, sounds, and smells of city life while being held close and secure to their handler but still with their mother. The pups develop an adult-like brainwave pattern between 7-8 weeks of age. Mom begins to finish the weaning process sometime between 8-10 weeks. After mom weans the pups, human bonding begins in earnest. After weaning, we begin one on one handler pup exercises and play. Intelligence and temperament go hand in hand. A fearful pup will be unwilling to problem solve in new or unique situations. Play is the best determinate of a dog's temperament and its willingness to express its innate intelligence. During play with a handler, a puppy must seek out novel approaches to problem solving. The handler is not training the pup, but allowing s/he to think for her/his self and to find her/his own solutions to the problems being presented. Earlier training is aimed more at left brain development. Play develops intuitive intelligence--an intelligence we prize most highly in or dogs. We began to play with puppies as soon as they offer to participate. In the early weeks, play is more exploratory or child-like play. Now, we begin structured games that involve problem-solving but are still energetic and fun. Because we only use positive reinforcement with puppies, our pups are not afraid of coming up with wrong answers, but will eagerly try multiple options to find a solution. We accept any creative resolution devised by the young puppy. We introduce specific games that teach our puppies that we will listen to them if they try to communicate with us. Dogs will stop trying to communicate with us when they figure out we are deaf to their attempts. We break down this wall early so our dogs learn that they not only listen to us, but that we will also hear them. Our languages and communication style may be very different but the gap can be bridged. A true working dog not only listens...s/he also talks. We teach new owners these communication skills during our super puppy course. “Lots of people talk to animals,” said Pooh. ”Not very many listen, though,” he said. Our puppies are not placed in a home until they are ten weeks old. We do this for three reasons. One, parents who are not locked in a kennel or whelping room do not tire of their pups but continue to be active participants in their upbringing. Second, puppies that are not prematurely removed from their parents tend to have confident, joyful, balanced demeanor. We know that attachment parenting develops emotionally intelligent, confident human beings. We believe it works the same for dogs. By supporting and allowing the natural bond between pups and their mothers, our pups are confident and ready to bond strongly with their new family. Stressing puppies and their mothers with forced early separation is not necessary to develop independence. Independence flows naturally from a strong bond with mom during their critical developmental weeks. As the pups mature the family pack also offers the pups a sense of protection and freedom to explore the natural world without fear, which leads to confidence, courage, and composure. Below a puppy is learning how to behave and relax during a restaurant meal by imitating the behavior of our medical alert service dog. Without any intervention from her trainer, the puppy learned what was expected of her in a new, highly stimulating environment. Simply by following the lead of her doggie mentor, she painlessly adapted to this new situation. Whether this pup becomes a service dog or a family companion, she knows how to behave in restaurants, outdoor cafes, or at your dinner table. Our puppies do not go from a kennel to your home. Our puppies have experienced weeks of handling, enrichment, socialization, and training before they arrive at their new home. Proper training and socialization of a young puppy is a precise, time consuming, and labor intensive endeavor. This is why we have developed our program. We want our families to know the joy of dog ownership. Even very well socialized puppies can regress and lose their bond with humans and other dogs when placed alone in a kennel run. They may develop a fear of leaving their kennel which can lead to phobias and fear aggression. There is term for this in the horse world which is "stall crazy". In dogs it is referred to as "kennel-dog syndrome". The German Shepherd Dog seems to be the most vulnerable to the development of this syndrome. At nine weeks we begin to introduce the physically astute puppies to the agility field.